Taste the Difference of Great Granola. Nana’s All Natural Foods. Nana’s All Natural Foods is a family-owned and operated, Sonoma-based company. All of Nana’s products are made the old-fashioned way: mixed in small batches and baked at a low temperature to preserve the natural, healthy goodness. 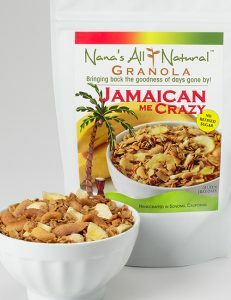 Jamaican Me Crazy is a tropical granola blend with toasted organic coconut, cashews and banana chips, sweetened lightly with organic coconut nectar and embellished with pure vanilla extract. 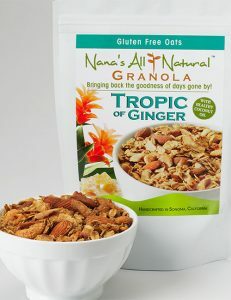 Tropic of Ginger is a ginger lover's dream – a perfect blend of almonds, cashews, shaved coconut and, of course, crystallized ginger with certified gluten-free oats. Made in small, slow-baked batches and lightly sweetened with a touch of maple syrup. 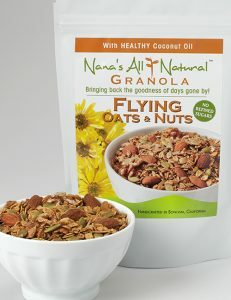 Flying Oats and Nuts is a delicious blend of almonds, walnuts, the finest organic oats, and seeds (sunflower and pumpkin), delicately sweetened with maple syrup and flavored with a touch of spices. 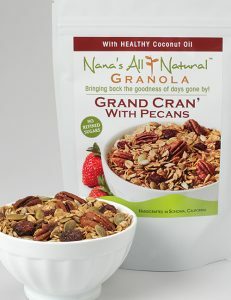 Grand Cran With Pecans is great blend of cranberries, pecans, organic pumpkin seeds, organic sunflower seeds, hemp seeds, and cinnamon. 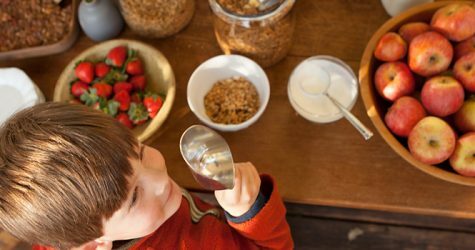 With an emphasis on delicious, organic ingredients as the source of flavor, Nana’s approach is simple: no artificial ingredients, no preservatives, and no genetically modified organism (GMO) ingredients. But we also go one step further, seeking to ensure that our unique flavors come from the quality main ingredients and from a creative use of spices. The goal is to create a healthy sweetness, typically half or less of the sugar found in most store brands. That’s why, from Nana’s home to yours, we create quality you can trust. When you eat Nana’s All Natural, you can be sure that it’s: made with the highest quality organic ingredients, slow baked to retain the goodness. Low in sugar, sweetened naturally with maple syrup or coconut sugar. Nana’s has only 3 grams of sugar per serving! Most big brands have 8 or more grams. Packed full of flavor without packing any artificial ingredients! Always preservative & GMO-free too! How do I eat thee?